Exchange project space. : EXCHANGE Window space. EXCHANGE Window space is a large glass shop front on Roach Road. A place to display your work, let people know about an event, leave a message or ask a question. We want to open this space up to the local artistic community as well as the local community. To curate a changing assemblage of artworks, posters, banners, messages and celebrations. 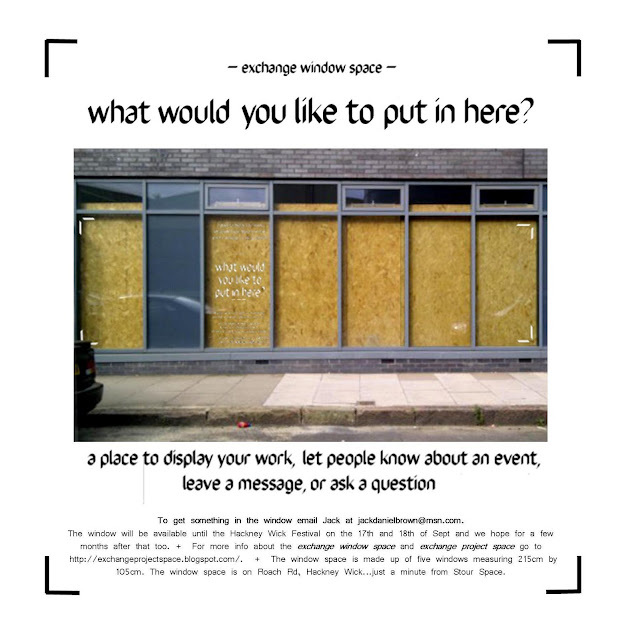 If you want to get something in the window please come to exchange project space. Unit 14, queens yard, white post lane, hackney wick. We are open Saturdays 12 till 5. Or email jackdanielbrown@msn.com.